Nirupam won his choice of $200 gift certificate with Bluewater Photo or Bluewater Travel! 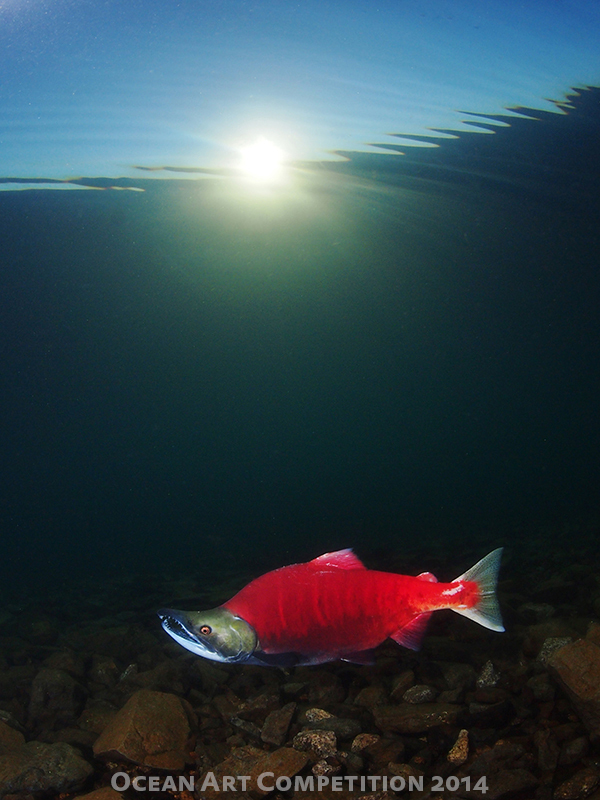 This photo is of a beach-spawning male sockeye salmon in Lake Iliamna, AK. It is also the last photo I took that day before my battery died. I was happy with this photo in particular because you can tell how calm the water is and the afternoon sun really sets the mood.Taking photos of salmon in Alaska can be fairly difficult as the lake water is very cold, and it is necessary to free dive as there isn't any infrastructure for scuba diving. So you end up freediving and chasing after salmon in a drysuit. Every year, salmon come to Lake Iliamna in the millions, often spawning near "beaches" around the lake. These salmon spawn from about 5 ft to 30 ft underwater. The females dig redds, or nests, and fight for territory while the males size each other up leading to some displays and fights that are pretty amazing to watch. A side fact - Lake Iliamna is one of the few places in the world with a population of freshwater seals. Camera: Olympus OM-D E-PM1, Lumix 8mm fisheye lens, Olympus housing, dual Sea & Sea YS-D1 strobes.